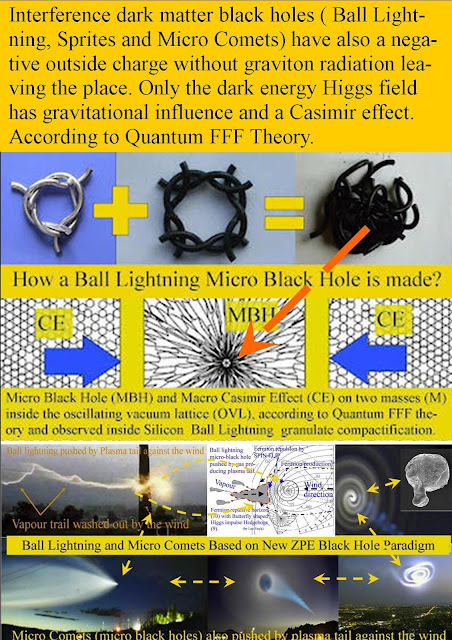 The discovery of the xray source at the tip of each lightning is a strong support for the mini Quantum Knot- Black Hole -lightning paradigm of Quantum-FFF Theory . WE NOW CAN SEE HOW A LIGHTNING SEARCHES IN DIFFERENT DIRECTIONS FOR ONLY ONE ROUTE WITHIN A SPLIT SECOND. The key question however is: what are those incredible fast MOVING tadpoles. 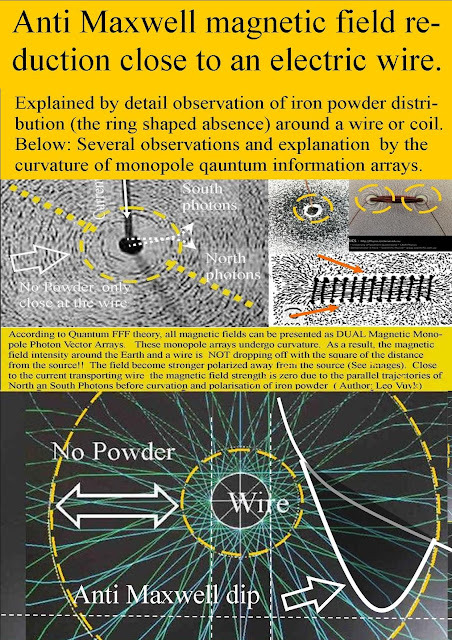 My proposal: dark matter quantum knots made by EM interference, just like silicon discharge in the lab. J.Dwyer found recently out that the tip of the lightning bolt emits xrays!! conclusion: this is a strong support for a splitting MINI BLACK HOLE ( quantum knot). OR we could compare this splitting process with the splitting BIG BANG black hole as the creation of the Lyman Alpha forest. 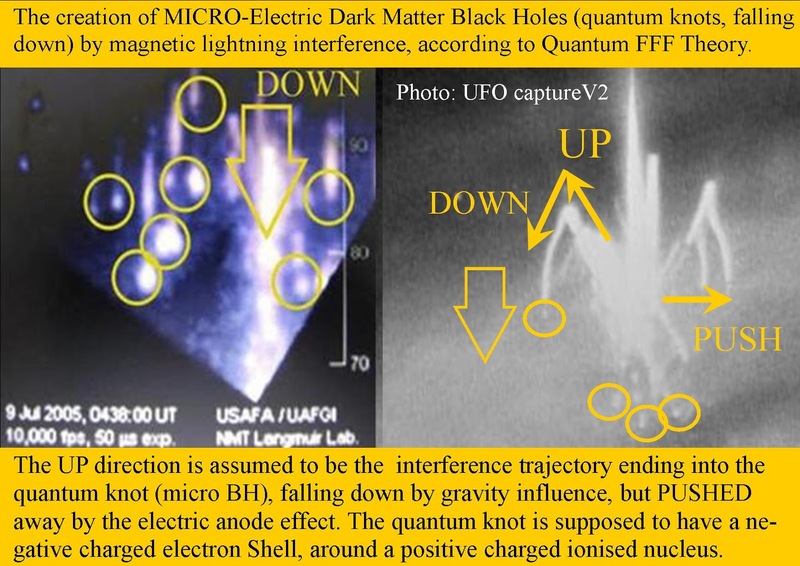 according to Quantum FFF Theory..
HOW DOES A QUANTUM KNOT interference black hole look like, see below. 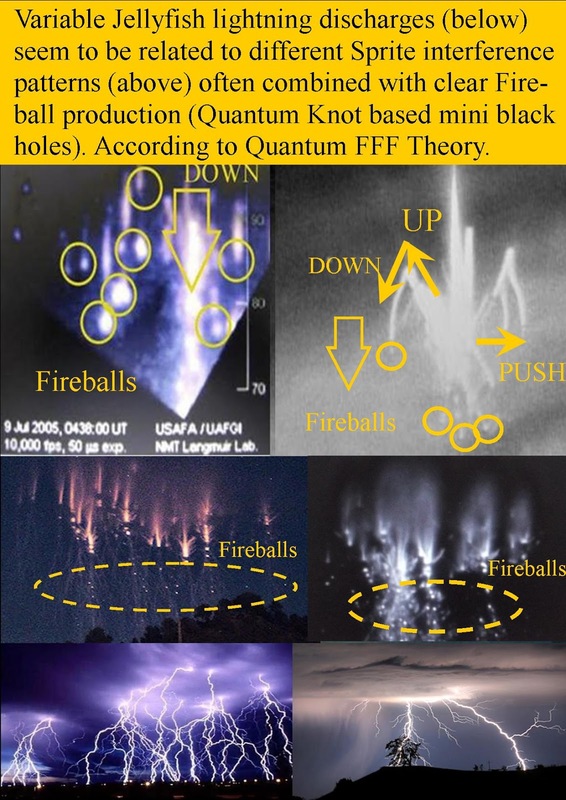 Cryo Meteors the remnants of new physics micro/ mini black holes? Evidence for new micro/ mini black hole physics? In the world of visible things, the principle of opposites makes possible the differentiation by categories through which order is brought into the world. 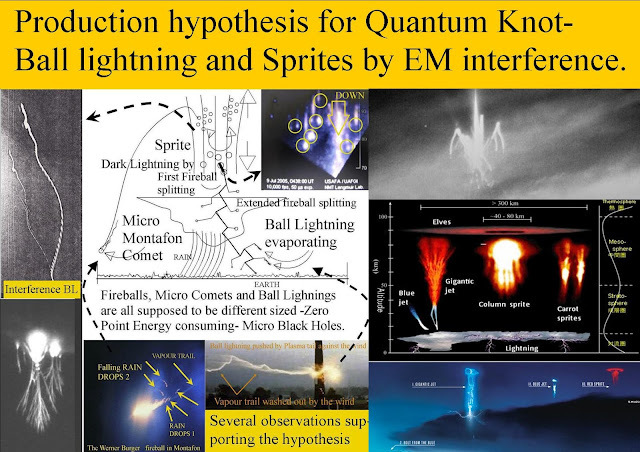 So if we can describe a mini Black Hole like ball lightning or cryo meteor in nature and compare the qualities with that of the different Hawking black hole proposals, then we are on the right track for new physics. 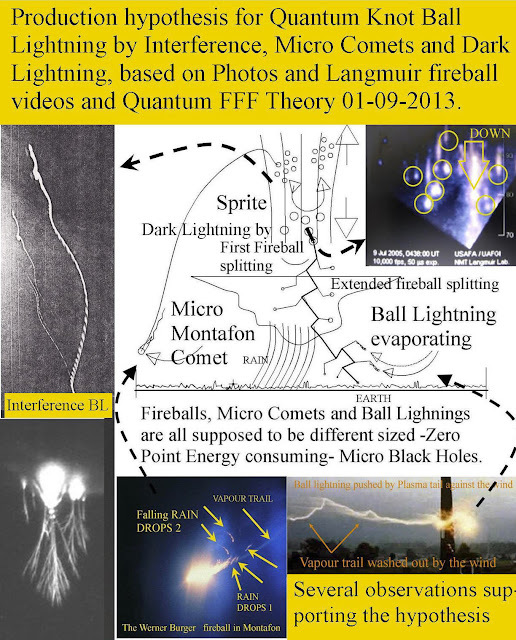 INCREDIBLE video of a splitting micro comet ( earth produced by lightning SPRITES) , as a strong support for Quantum FFF Theory based NEW ELECTRIC DARK MATTER MICRO BLACK HOLE with a quantum knot as nucleus and reaction less propulsion possibilities against the wind !!! To me this seems to be NO HOAX, if you realize that a normal hoax would have managed that the little fireball according to the mainstream physicists should have kept about the same direction of motion as the mother micro comet. However this very clever video seems to prove the opposite, by introducing so called blurring effects which are not real and based on mistakes from the adobe hoax software CGI. I see no mistakes if I use my eyes well. 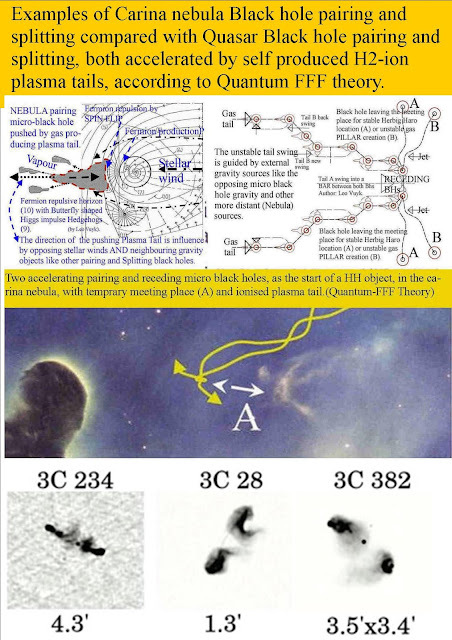 Secondly, I observe the same blur in the nearby roof top and not only in the micro comet.. In contrast, based on the former video, I only have to change my proposal concerning the wind direction. The wind seem to come from the left side of the video, at that altitude. Because the speed of the micro comet is not constant. 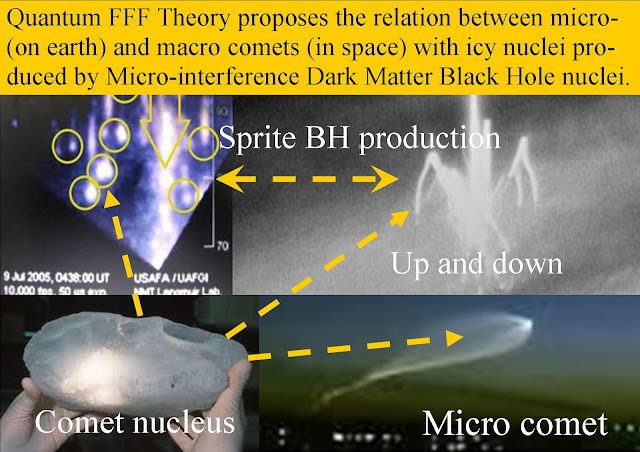 I assume that the icy micro-comet nucleus is only a small one ( created by Sprites above thunderclouds far away) and still propelled by the combination of a gas tail and quantum knot ( Quantum knot is: a micro black holes). just as is observed in the Japanese ball lightning photo near the railway crossing ( see below). 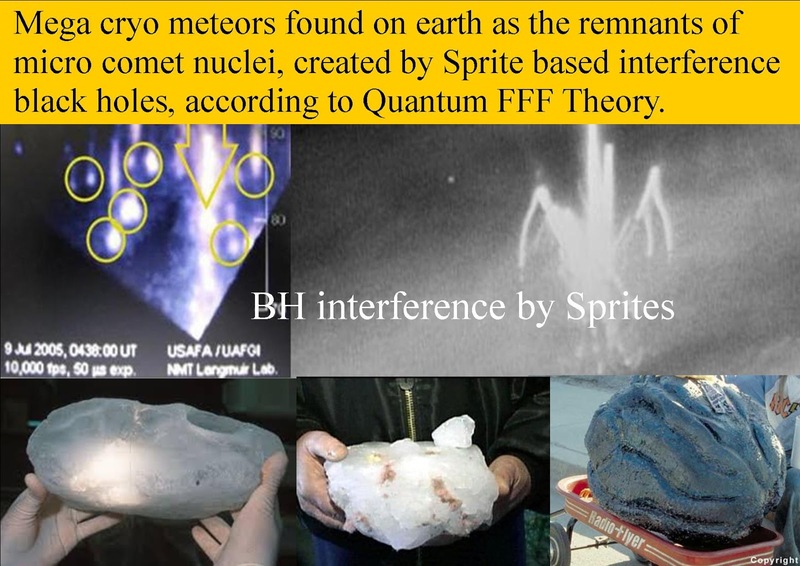 Cryo- meteors are chunks of ice, incidentally falling from the sky and supposed the remnant of a micro comet's nucleus according to Quantum FFF Theory. Direct after the creation of a sprite based Quantum Knot ( or interference dark matter black hole) the quantum knot produces Hydrogen and Oxygen together forming a growing water ice shell around the nucleus.. This growing ice chunk is influencing the propulsion direction of the micro comet together with the outgassing vapour tail. 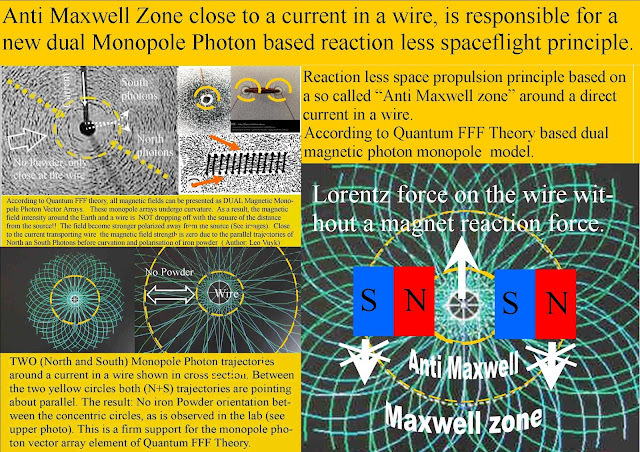 Equivalence of acceleration and gravity and also Black hole- and Planetary gravity does not hold in Quantum FFF Theory. 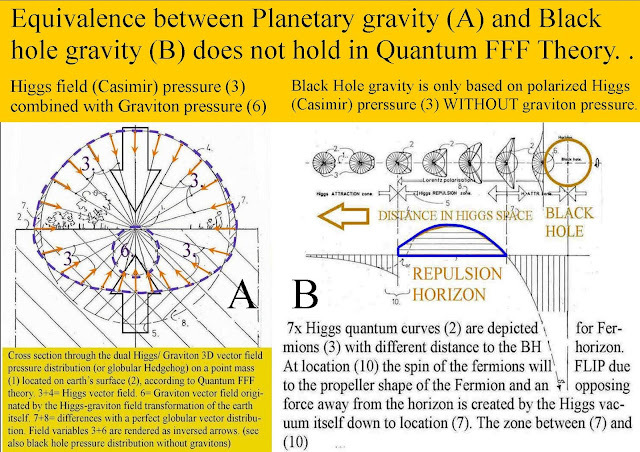 Equivalence between Planetary gravity (A) and Black hole gravity (B) does not hold in Quantum FFF Theory. B; Black Hole gravity is only based on polarized Higgs(Casimir) prerssure (3) WITHOUT graviton pressure. 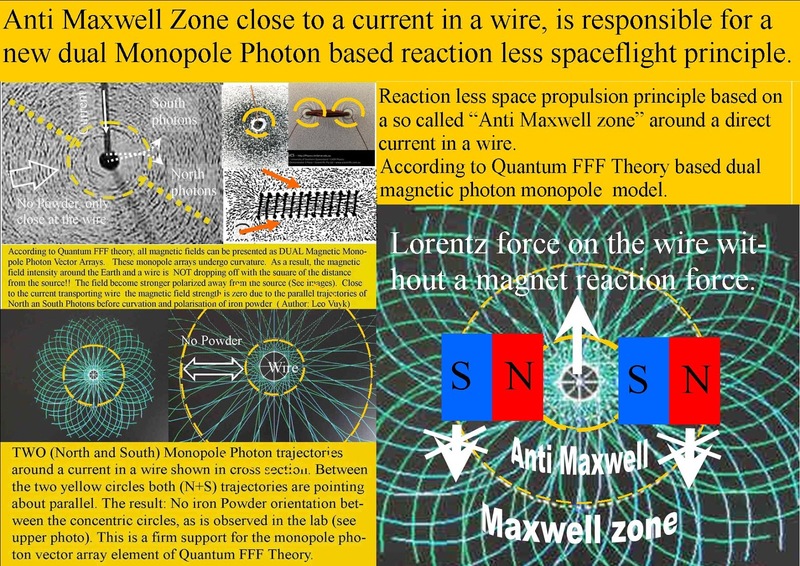 The REPULSION ZONE (Fermion reverse gravity) does not act on photons. 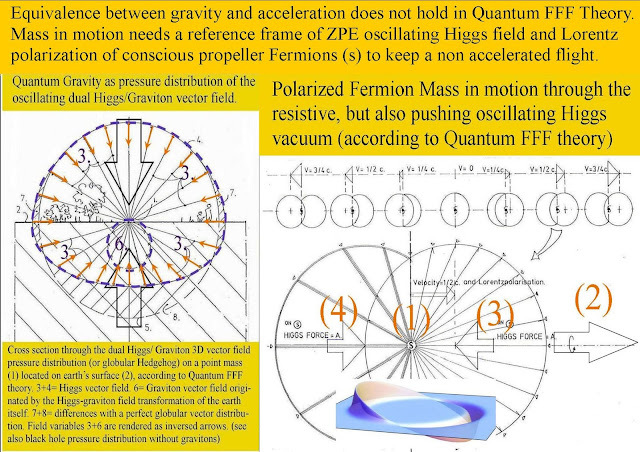 Equivalence between gravity and acceleration does not hold in Quantum FFF Theory. 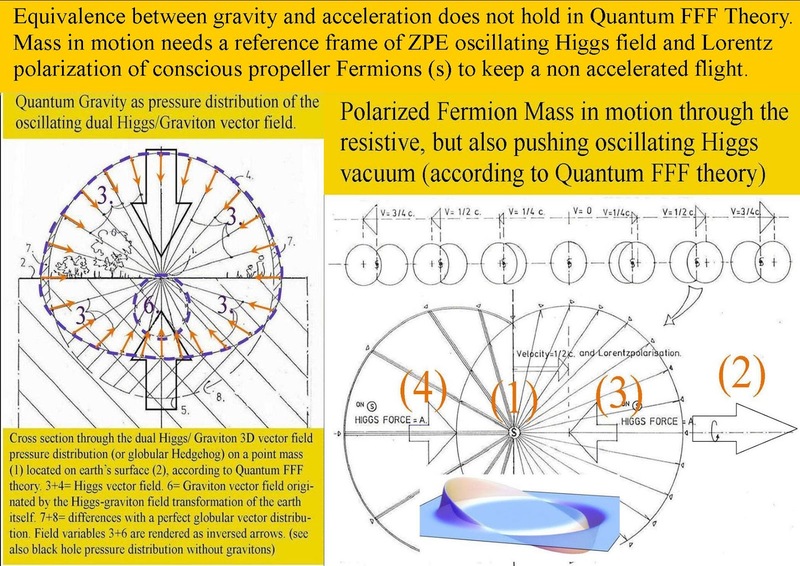 Mass in motion needs a reference frame of a ZPE oscillating Higgs field and Lorentz polarization of conscious (Multiverse connected) propeller Fermions (s) to keep non accelerated flight constant. Acceleration with 1 G does change the picture only temporarily a little bit. 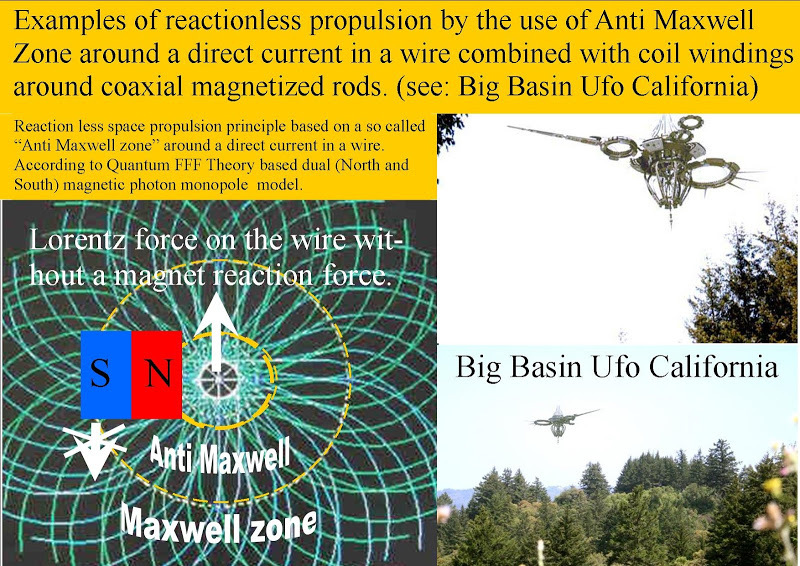 Examples of reactionless propulsion by the use of Anti Maxwell Zone around a wire.